Cookbook author Sheila Lukins died yesterday at the age of 66 from brain cancer at her home in Manhattan. She was a New York food institution and an arbiter of food trends in the 80s and early 90s, and she deserved a much better obituary than the one she received from Julia Moskin at the New York Times today. The NYTPicker goes through it with finer comb than we ever could, but the gist of it is that the obituary is riddled with errors and strange omissions: an anecdote from a former editor appears to be incorrect, and Moskin leaves out the cerebral hemorrhage Lukins suffered in 1991. Most strange is the omission of Lukins' very public feud with former partner and co-author, Julee Russo, with whom she wrote her most famous book, The Silver Palate Cookbook (buy at Amazon ). On a more positive note, it is worth remembering that Sheila Lukins was one of those rare cookbook authors who actually changed the way we eat. Much in the way Julia Child turned cooking into a passionate, creative act in the 1960s, Lukins forged a path for professionals who had an interest in gourmet foods, but didn't necessarily have the time to learn the intricate French techniques that usually accompanied them. I cannot recall ever seeing a copy of The Silver Palate Cookbook in mint condition. That is to say, the familiar burgundy tome found on so many cookbook shelves is used, frequently, and most often exists in a food-stained, broken-spined, frayed, and annotated state. In the age of the pristine, gigantic coffee table cookbook, much-used, much-loved cookbooks are a rarity. Sheila Lukins will be missed for her ability to craft interesting, accessible recipes that became staples in our kitchens. 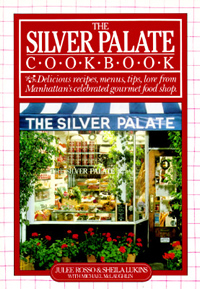 The Silver Palate is one of my most-loved cookbooks. That New York Times writeup was crap, I agree. I learned how to entertain as a young wife out of the Silver Palate cookbook. Such a creative person deserves to be remembered better than what the NYT has done. I thought the same thing when I read the NYT piece. She did deserve better. The NYT obit was hardly a fitting send off. I learned theory from Julia Child's books, but my real-life cooking came from the Silver Palate Cookbook, which I received as a wedding gift in the 1980s. I still have that tattered first copy of the book, and I use a second, very well-worn copy, on an almost weekly basis. I was so sad to learn of Sheila's death. Please tell me that she and Julee made up. I would hate it if they never made peace with one another. I think we'll be having Chicken Marbella tomorrow in Sheila's honor. I don't need the recipe anymore. It,and the confidence that learning to make it gave me, are both a part of me now. Thank you, Sheila. You'll be missed. Upon reading of her death, I brought out all of Ms Lukins' cookbooks that I own-- all of them, Im sure. The Silver Palate Cookbook was an inspiration to me, out on my own for the first time in the 80s. Since then, I would grab any cookbook with her name on it! (and would even search for her upcoming releases) I will also miss her contributions to Parade magazine, and , in her honor,plan to prepare many dishes from her last cookbook "Ten" (which I love),in the upcoming days.